Homemade dry erase board cleaners are not just for frugal teachers and parents anymore. Just about anyone looking to save money on cleaning supplies can benefit from do-it-yourself solutions that will restore dry erase boards to their original shine. Dry erase boards are extremely popular in schools, offices and homes. 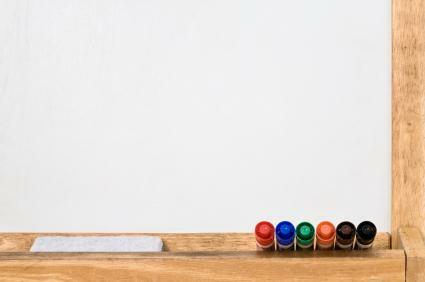 The convenient whiteboards are an ideal replacement for chalkboards and bulletin boards. What's more, they are very easy to clean and maintain. There are dozens of commercial cleaning products available for use on dry erase boards. Most contain bleach or alcohol, which erase ink and other stains. However, these name brand cleaning solutions can be costly to purchase and given that they use standard cleaning ingredients that most individuals have in their homes, it often doesn't pay to buy specialized dry erase board cleaners. Simply saturate a clean rag or some paper towels with rubbing alcohol and wipe away ink stains from your dry erase board. If you have stubborn ink stains, place the alcohol in a spray bottle and apply it directly to the markings before wiping dry. If you don't have straight isopropyl alcohol on hand, then consider using hand sanitizer, which also includes alcohol. You can apply a small amount of hand sanitizer on the eraser that came with your whiteboard or you can apply a couple of dabs to a clean cloth and wipe off any ink that the dry eraser will not remove. If you are really in jam, reach for antibacterial wipes. Wet Ones or other generic wipes contain alcohol that will remove ink and clean dry erase boards. Simply remove a couple wipes from the container and gently use on the entire surface of the whiteboard. Vinegar is an indispensable household item that multitasks like no other. One of the cheapest homemade dry erase board cleaners calls for vinegar and water. Mix equal parts of the two liquids and apply the solution to the whiteboard. For tough stains, allow the homemade cleaner to sit for a few minutes before wiping with a clean cloth. Generic glass cleaner is another phenomenal product to maintain dry erase boards. Standard household glass cleaner contains alcohol and other ingredients that quickly dissolve dirt, dust and ink residue. However, some glass cleaners can be abrasive to whiteboard surfaces, so it's a good idea to use a damp, soft cloth when wiping off any excess glass cleaner. Hair spray is another common homemade white board cleaner. The alcohol contained in the spray helps lift dirt and ink. To use, simply spray hair spray on the dry erase board, and allow it to sit for about two minutes before wiping it clean with a damp cloth. The trick is to not let it sit for too long or you will be left with a sticky mess. While these ingredients will clean your whiteboard, there are some professionals that warn you to use care when using homemade cleaners on dry erase boards. For instance, Magnatag whiteboard system notes alcohol can be dangerous for whiteboards. This is because it can deteriorate the surface of the board, removing the lubricating layer. This will make whiteboards lose the ability to be wiped clean. Additionally, other companies like Quartet, note all-purpose cleaners like glass cleaner can destroy the surface of the board. It can even void the warranty of some whiteboards, like Smith System. Additionally, many companies note use of an abrasive cleaner will void the warranty. Therefore, prior to using any homemade dry erase cleaners on your board, check your warranty information and recommended cleaning products to ensure what you use won't harm your board in the end. Erase frequently: Don't wait days before erasing large amounts of writing. Instead, erase notes as soon as you are done with them. Also, when erasing a whiteboard, don't just clean off the areas with the markings. Rather, clean the entire board thoroughly after each use. Soap and water: Rather than wait until your dry erase board is full of leftover markings, consider cleaning it with mild soap and water on a weekly basis. Dip a sponge into a mixture of soapy water and gently scrub the board. Then, dry with a soft towel. Quick fixes: Used dryer sheets, white shoe polish, nail polish remover, and toothpaste are common products used by some people to erase stains from whiteboards. They may or may not work for your board. If you attempt to use them, make sure you run a test on a small portion of the board to see if it is compatible with the coating of the board. Never use coins or other hard, sharp objects to scratch off stubborn marks from a dry erase board. Doing so will damage the surface of the whiteboard and decrease your writing space.